A tiny add-on that exports a small Python file containing OpenGL code to display a mesh. Blender has OpenGL bindings available for use in Python scripts. 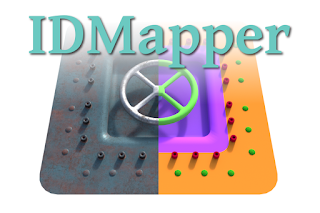 You can use these OpenGL drawing commands to display for example overlays over your 3D view with a draw handler. If you would want to draw some sort of complex object you would have to recreate it using glVertex3f() calls which is a lot of work as soon as the model is more than a few vertices. 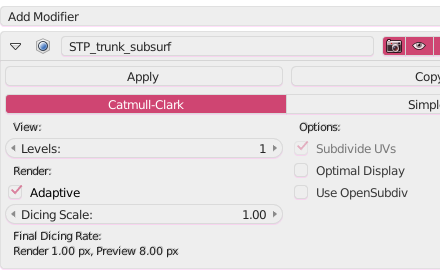 This add-on generates the code for you in the form of a function that creates a display list. 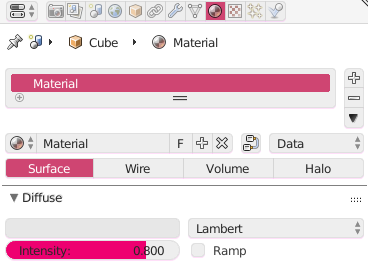 When you select File -> Export -> Export mesh as OpenGL snippet it will open a file dialog and then it will write Python code to the selected file. It will write the vertex coordinates (in object space) and the vertex normals of the active object. 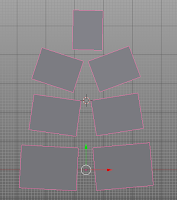 It will triangulate the mesh internally before writing it. 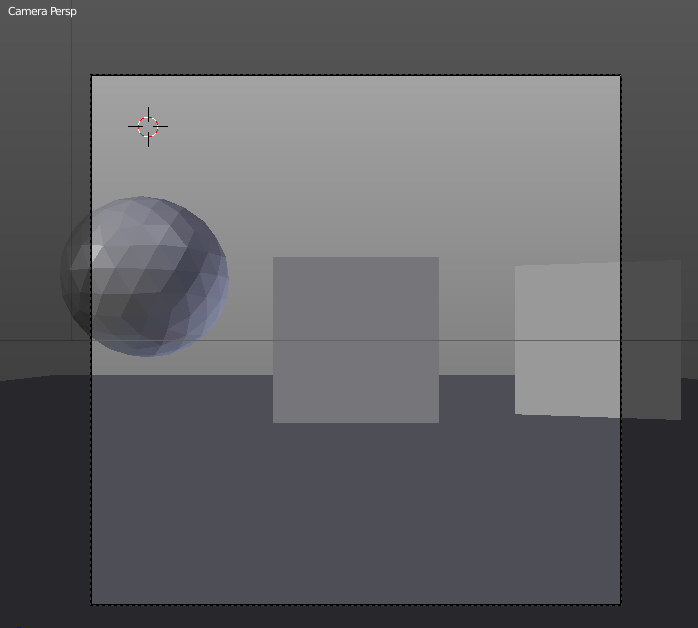 There is currently no check if there is an active object or that the active object is a mesh. What does the resulting Python code look like? That code is so old fashioned, why? If you ask any questions on forums like stack-overflow about older versions of OpenGL (and old in this context essentially means anything before OpenGL 3.0) you will be told over and over again that you shouldn't use it and that investing time in it is wasteful or even stupid. The fact is that even though Blender certainly runs on newer versions of OpenGL, the Python bindings it provides are based on version 2.1 and I am not sure when that will change. 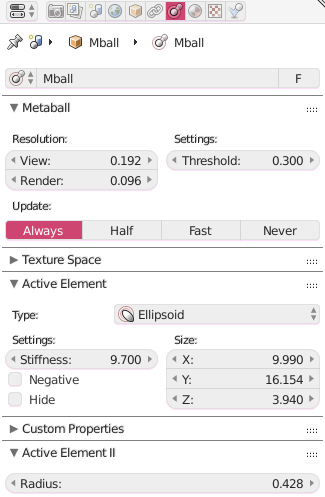 And yes, even 2.1 supports stuff like vertex arrays but those are quite cumbersome to use, not documented in the Blender Python API any in many situations overkill and not really a speed improvement: If all you want is some fancy overlay, using a compiled display list is pretty fast. The add-on is available on GitHub. 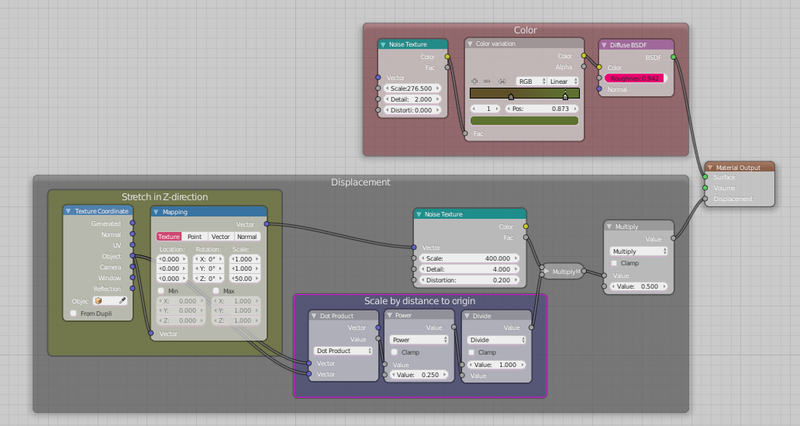 I am happy to announce that yesterday I published my new TextureWatch add-on on Blendermarket. 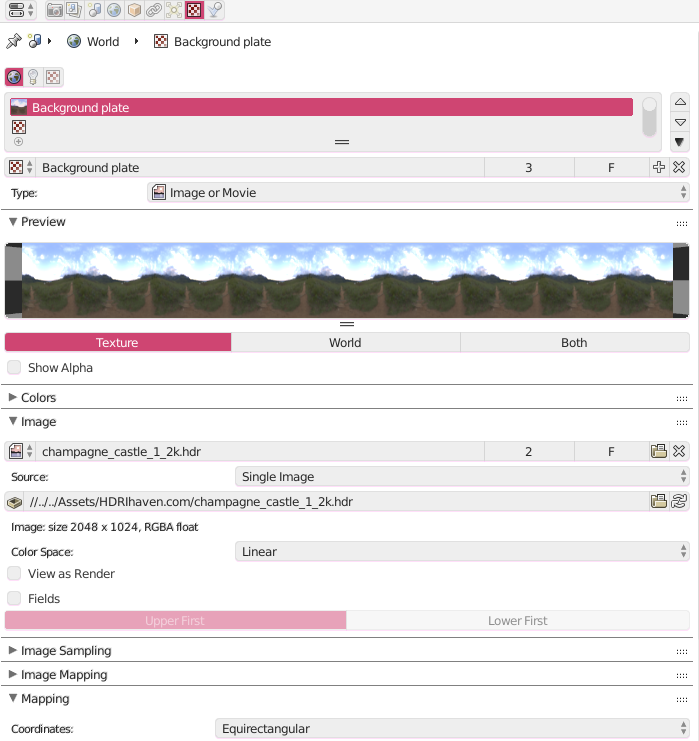 As illustrated in the video, TextureWatch is a small add-on to automatically synchronize textures used in your .blend file if they change on disk. This simplifies working with external programs like Gimp or Substance Painter because TextureWatch can automatically update those textures when you save your files without the need to go through all images inside Blender one by one and selecting reload. This saves time as well as guarantees consistency. If you find this useful you might want to take a look at my BlenderMarket store. I recently bought the Graswald add-on because the sample images looked really good and the collection of plant species, variations and leaf debris on offer was quite extensive. A couple of years ago I also bought Grass Essentials and although that was (and is) is fine collection of grasses and weeds too, I always found it rather difficult to get naturalistic looks. 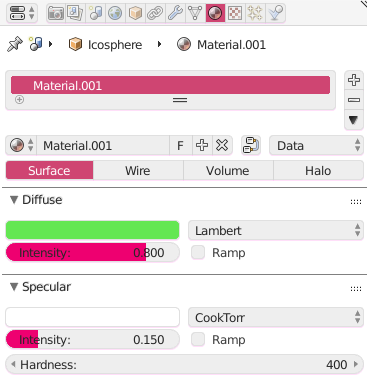 Both products have options to change things like the patchiness or wetness of the plants but I feel that Graswald, being an add-on*) with all the configurable options in a toolbar panel is far easier to work with and offers some extra possibilities, like integration with weight painting for distribution and length as well as aging a percentage of the plants . 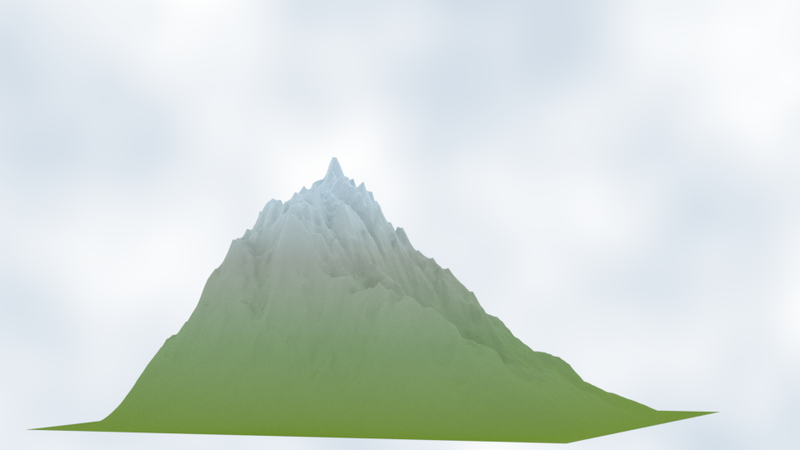 *) It is also available as an asset library without the add-on at a slightly lower price. To show you what I mean I spent some time trying to recreate a patchy grass field consisting mainly of Kentucky Rye grass sprinkled with lots of dandelions. It took me about 10 minutes to set up the Grasswald patch on the left and although the time it took to set up the Grass Essentials patch on the right was about the same, I lost some time because although Grass Essentials does have dandelion flowers and seed-heads, it does not have a particle system to represent the actual dandelion plant leaves, so I finally substituted those with plantain to get at least some leaves showing. 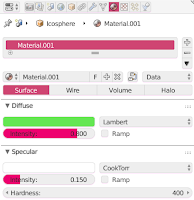 Now everybody knows I not much of an artist and probably with some extra time the Grass Essentials version could be made to look more varied and patchy but for me the ease of use and the quality of the end result speaks for itself. Given this quality and ease of use combined with the slightly lower price, Graswald easily wins out on value for money. 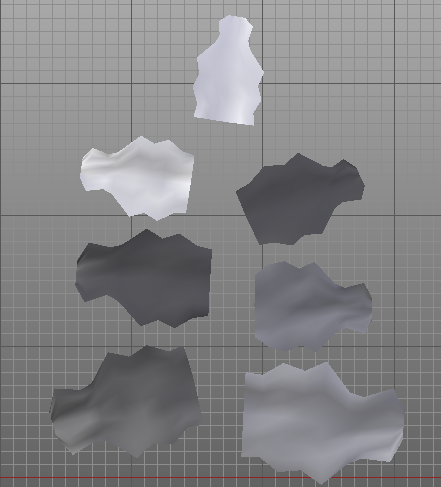 If we want to diminish the jagged look of edges in our rendered image we can sample a pixel multiple times at slightly different positions and average the result. In this article I show the code to do this. 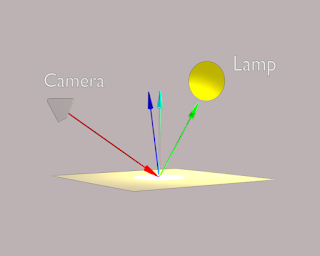 Once we know how many times we want to sample a pixel we have to calculate our camera ray as many times but with slightly shifted coordinates and then average the result. If we take the original direction of the camera ray to point into the exact middle of an on screen pixel, we have pick a point in the square centered around this point. For this we first calculate the size of this square (line 9 and 10). Then as before we calculate each pixel but we repeat this for every sample (line 14). We keep the sum of all our samples in a separate buffer sbuf (defined in line 5, the addition is in line 23). We still want the final buffer that will be shown on screen to represent the averaged color we calculated so far, so in line 15 we update a whole line of pixels to represent the current average. We also invert the line above it (line 16,17) so we have some visual feedback of where we are when we are updating the buffer. 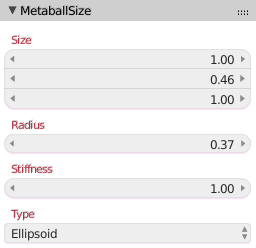 This is useful to keep track as with increasing samples the contribition gets smaller and might be hardto see. 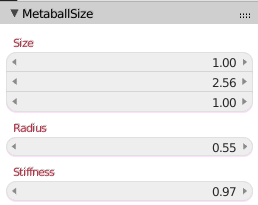 Finally we yield the percentage of samples we calculated so far. Note that the vdc() function returns a number from a Van der Corput sequence. I have not shown this function and you could use uniformly distributed random numbers instead (shown in the line that is commented out) in stead of these quasi random numbers, but these should give better results. The reasoning behind this is out of scope of this article but check Wikipedia for more on this. 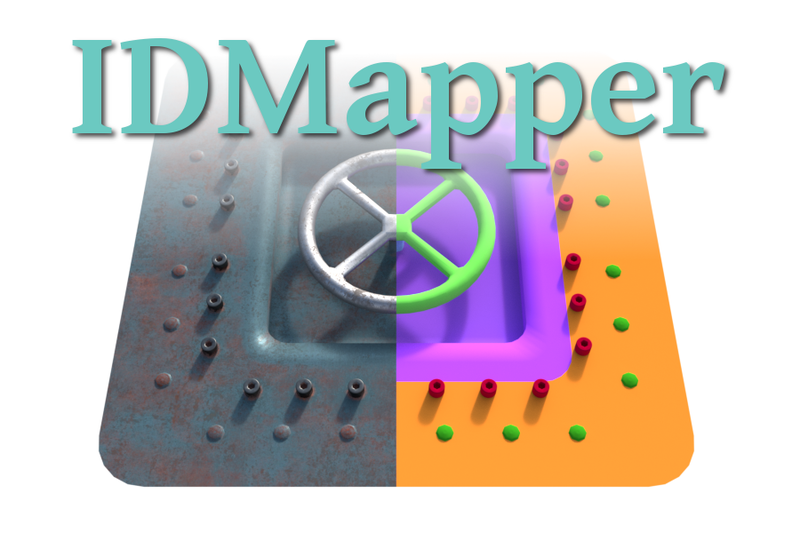 The revision containing the code changes from this article is available from GitHub. 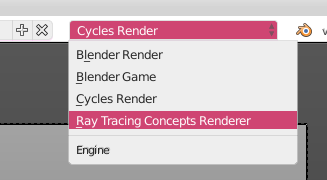 The bits of code we show in this article have less to do with raytracing per se but do show off the options to indicate progress in Blender's RenderEngine class. Not only gives this some visual feedback when rendering takes long, it also gives the user the opportunity to cancel the process in mid-render. First we change the ray_trace() function into a generator that returns the y-coordinate after every line. This is accomplished by the yield statement. So now the function doesn't allocate a buffer itself but it takes a buf argument. The render_scene() is changed too: it allocates a suitable buffer and then iterates over every line in the render result as it gets rendered (line 9). 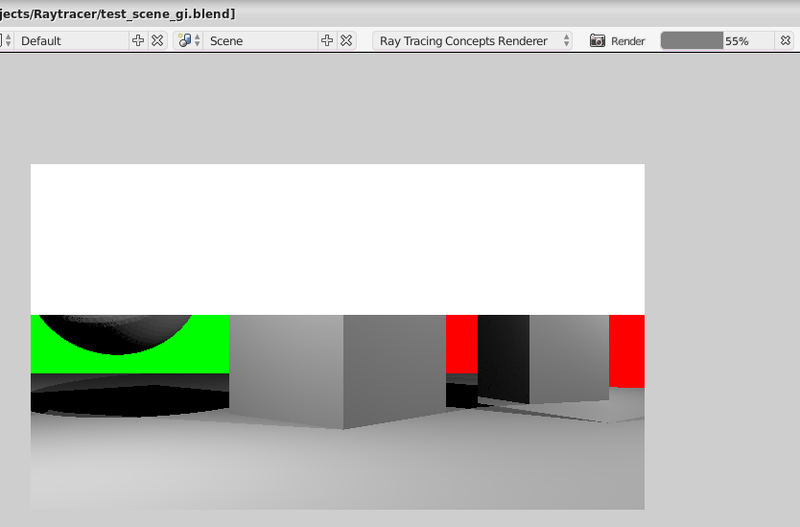 It then calls the update_result() function of RenderEngine class to show on screen what is rendered so far (line 12). It also calculates the percentage that has been completed and signals that as well (line 14). The code for this article is available in this revision on GitHub. 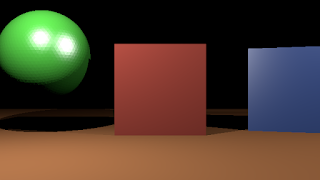 (Note that it already contains some none functional global illumination code that you can ignore). When a ray does not hit anything we would like it to intersect with some infinite spherical background. Any image texture object offers an evaluate() function that will take two arguments x and y between [-1,1] and will return the color at that point. The point (0,0) will be exactly in the middle of the regardless of its dimensions. If we assume this image covers the whole <em>skydome</em>, this means that all we have to do when a ray doesn't hit anything in the scene, is to find out how high above (or below) the horizon the ray is pointing and in what direction along the horizon. The first item is called the elevation (or altitude) and ranges from -90° (or -pi/2 , pointing straight down) to +90° (+pi/2, i.e. straight up). The second item is called the azimuth and ranges from -180° (-pi) to +180° (+pi) relative to some fixed direction. We will use the positive x-axis as our reference. Given a normalized direction in cartesian (x,y,z) coordinates, finding the elevation (theta) and azimuth (phi) is pretty straightforward. Because the dir vector is normalized the z component will give us the cosine of the angle between the vector and the z-axis. The conversions are necessary to relate this angle (theta) to the horizontal plane and scale it to [-1,1]. The angle phi is calculated relative to the positive x-axis. The color we get pack from the evaluate call may contain an alpha channel therefore we make sure we only keep the first three components with the .xyz attribute. For a more in depth explanation you might want to take a look at Paul Bourke's site. The code for this revision is available from GitHub. Until now the reflections have been a bit dull because our shader model only takes into account the diffuse reflectance, so lets take a look at how we can add specular reflectance to our shader. The effect we want to achieve is illustrated in the two images below where the green sphere on the right had some specular reflectance. Because of this it shows highlights for the two points lamps that are present in the scene. 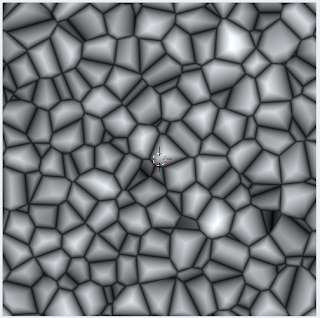 The icosphere shows faceting because we did not yet anything to implement smooth shading (i.e. 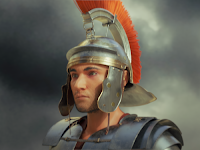 interpolating the normals across a face) but with added some smooth subdivisions to show off the high lights a bit better. 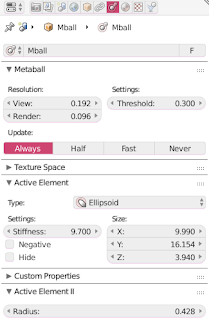 In the image below we see that we also look at the hardness of the specular reflections in our shader model, with a high value of 400 giving much tighter highlights than the default hardness of 50. In both images the red cube has no specular intensity and the blue one has a specular intensity of .15 and a hardness of 50. 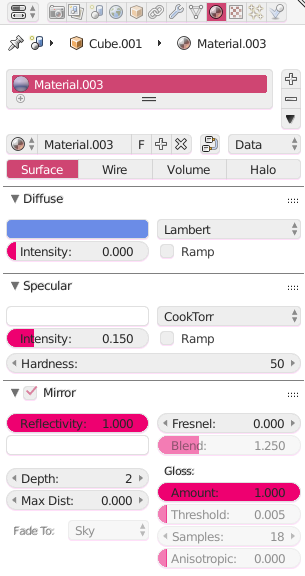 Specular color, specular intensity and hardness are properties of a material so we have also exposed the relevant panel to our custom renderer so that the user can set these values. 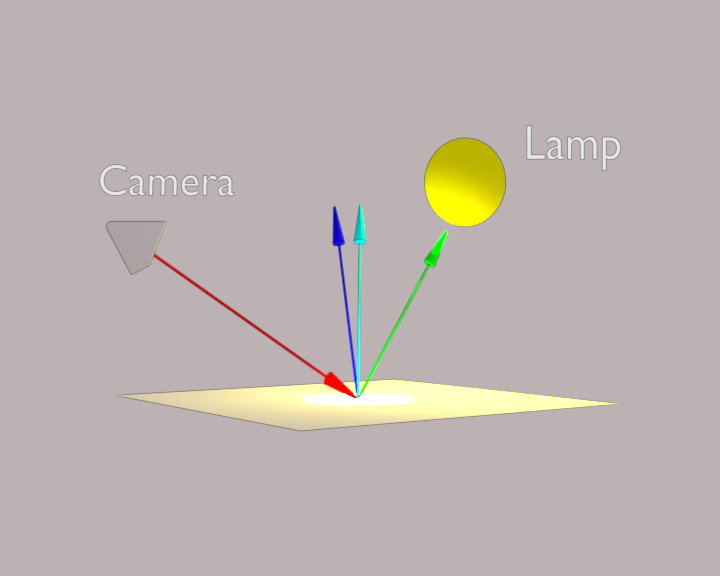 For the specular component we use the Phong model (or actually the Blinn-Phong model). This means we look at the angle between the normal (shown in light blue in the image below) and the half way vector (in dark blue). The smaller the angle the tighter the highlight. The tightness is controlled by the hardness: we raise the cosine of the angle (which is what the dot product is that we compute in line 20) to the power of this hardness. 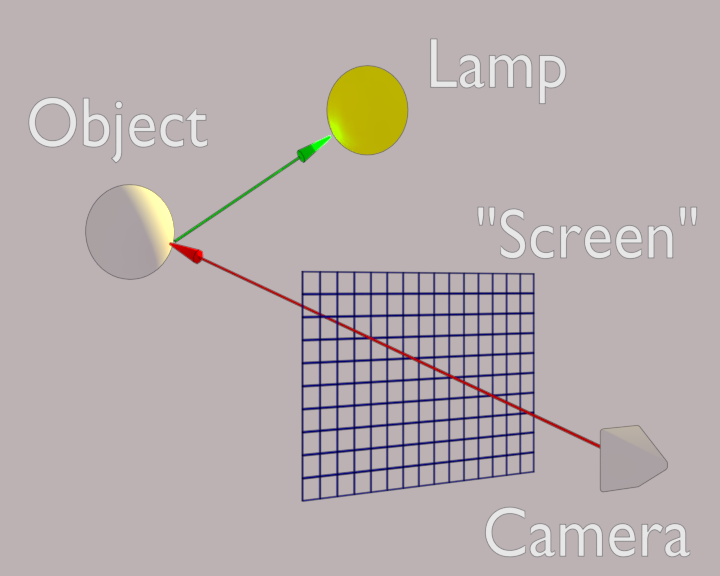 Note that the half way vector is the normalized vector that points exactly in between the direction of the light and the camera as seen from the point being shaded. That is why we have a minus sign rather than a plus sign in line 19 because dir in our code points from the camera towards the point being shaded. Our rendered scene so far mainly consists of fifty shades of gray and that might be exciting enough for some but it would be better if we could spice it up with some color. 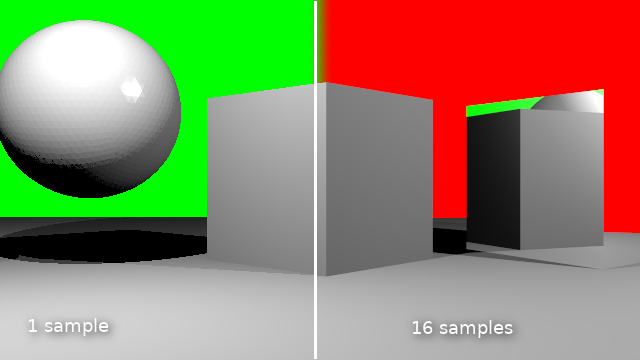 In lines 5-8 we check if there is at least one material slot on the object we hit and get its diffuse color. If there is no associated material we keep a default light grey color. This diffuse color is what we use in line 28 if we are not in the shadow. In a further bit of code cleanup we'd like to get rid of the hardcoded camera position and look at direction by using the location of the active camera in the scene together with its rotation. Later we might even adapt this code to take into account the field of vision, but for now at least we can position and aim the active camera in the scene any way we like. All we really have to do is to derive a class from Blender's RenderEngine class and register it.The class should provide a single method render() that takes a Scene parameter and returns a buffer with RGBA pixel values. bl_label = "Ray Tracing Concepts Renderer"
For a custom render engine all panels in the render and material options will be hidden by default. This makes sense because not all render engines use the same options. 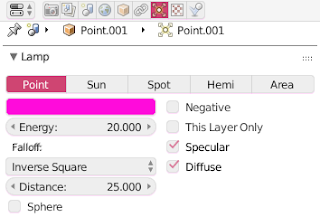 We are interested in just the dimensions of the image we have to render and the diffuse color of any material so we explicitly add our render engine to the list of COMPAT_ENGINES in each of those panels, along with the basic render buttons and material slot list. The code is available on GitHub. 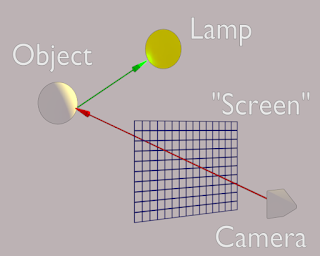 Remember that any test scene should be visible from an virtual camera located at (8,0,0) pointing in the -x direction. The actual camera is ignored for now. Recently I was offered a change to look at CinemaColour For Blender by FishCake. 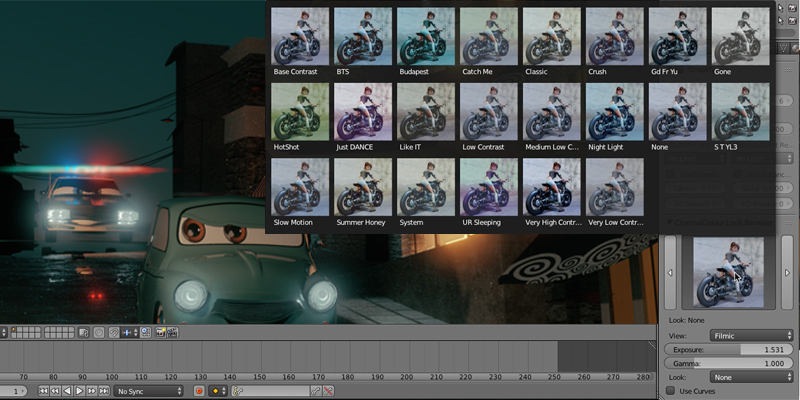 CinemaColour offers a large collection of professional color management looks (LUTs) to use with Blender's built-in Filmic color management. Check out the artist's website for some great examples. It comes in the form of an add-on that installs over a hundred looks and also offers a convenient way to browse and select the looks that are available. In this short article I'll have a good look at my experiences with the add-on and the looks it offers. Since well over a year Blender has incorporated Roy Sobotka's Filmic color management solution and everybody, really everybody, has been very enthusiastic about it ever since. 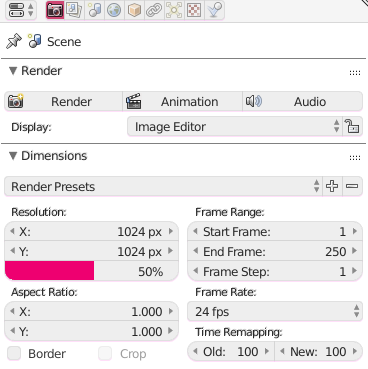 This enthusiasm is well deserved because when using Filmic your renders may almost immediately gain a lot of realism, mainly by mapping the wide range of light intensities in your scene to the limited range of intensities your monitor can handle in a much better way than before. 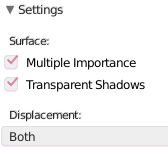 No more blown out highlights or loss in details in the deep shadows! 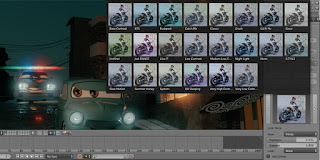 Filmic uses lookup tables (LUTs) to convert these intensities and by selecting different look up tables you can create different looks: not only can you choose these looks to present you with more or less contrast in your renders but because these lookups are done independently for all color channels you can use looks that add a color tone to your render. These tones can greatly influence the feel of your scene and because this mapping is done after the result is rendered and composited, it is very easy to experiment with the overall look. Note that we did not have to render our scene again to generate these looks, so generating these examples after render the scene a single time only took seconds. A great set of professional looks done by someone who clearly knows their color management. The selection of the provided looks is also intuitive and every artist that is serious about the overall look and feel of their renders should check this out. CinemaColour is available on BlenderMarket. 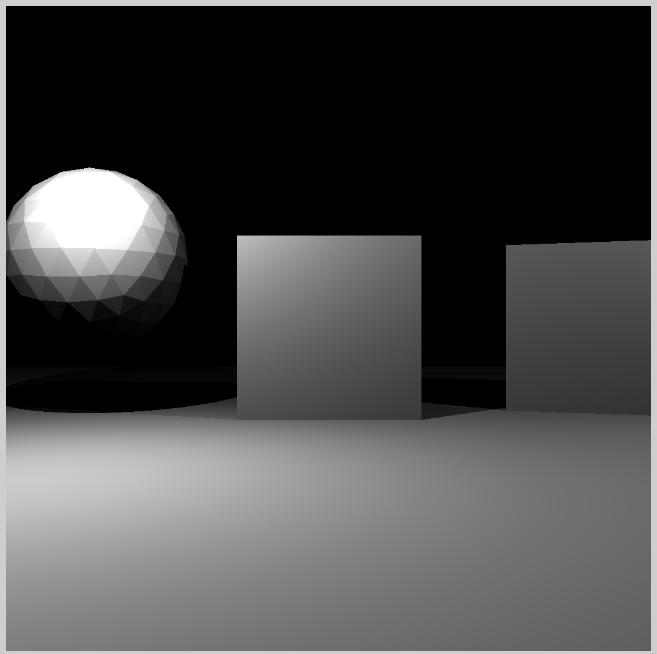 In this article I will show how to implement a minimal raytracer inside Blender. Of course Blender has its own very capable renderers, like Cycles, but point is to illustrate some ray tracing concepts without being bogged down with tons of code that have nothing to do with ray tracing per se. 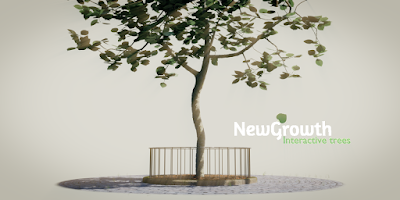 By using Blender's built-in data structures like a Scene and an Image and built-in methods like ray_cast() we don't have to implement difficult algorithms and data structure like ray/mesh intersection and BVH-trees for example, but we can concentrate on things like primary and secondary rays, shadows, shading models etc. etc. 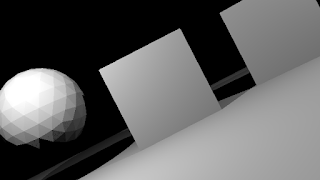 Nothing more than a plane, a couple of cubes and an icosphere. 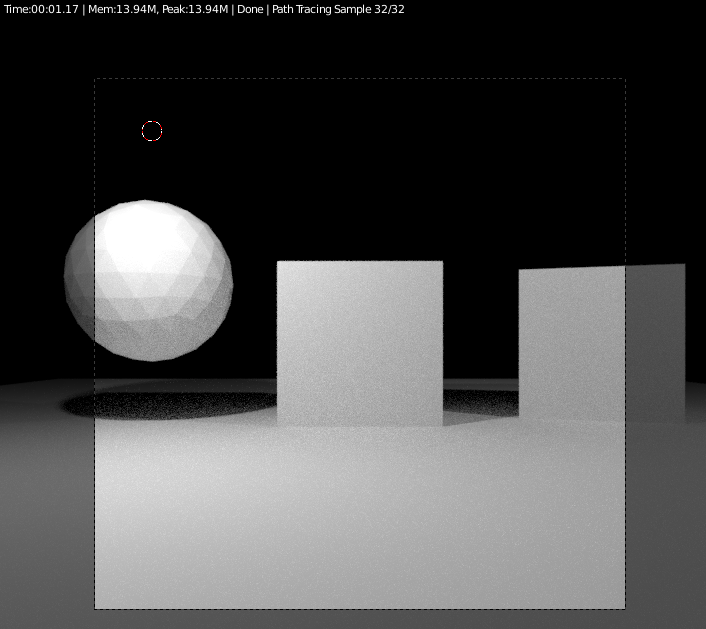 Plus two point lights to illuminate the scene (not visible in this screenshot). 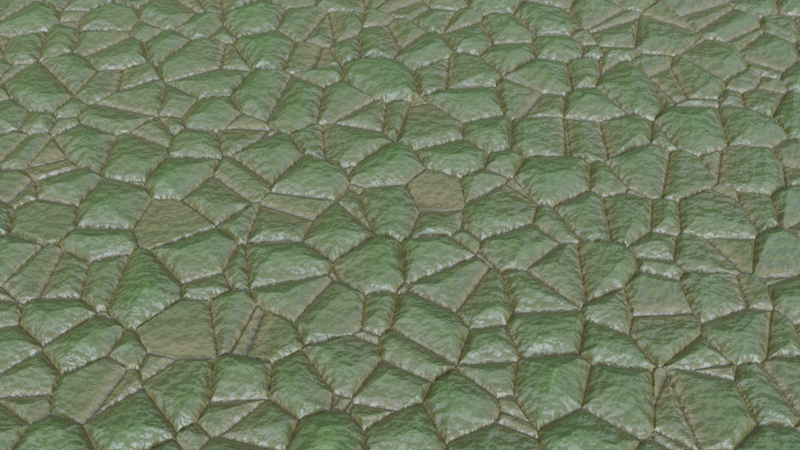 Note that we didn't assign any materials so everything is shaded with a default shader. There are clear differences of course, and we'll work on them in the future, but the general idea is similar: light areas close to lights and visible shadows. How many lines of code do you think is needed for this? I have added quite some comment in the code itself and will elaborate on it some more in future articles. For now the code is given as is. 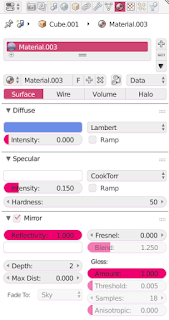 You can experiment with it if you like but you do not have to type it in nor create a Scene that meets all the assumptions in the code, you can download a .blend file that contains the code if you like. The goal of this article is to document as well as possible what is needed to create realistic trees in de middle distance while using as few rendertime resources as possible. 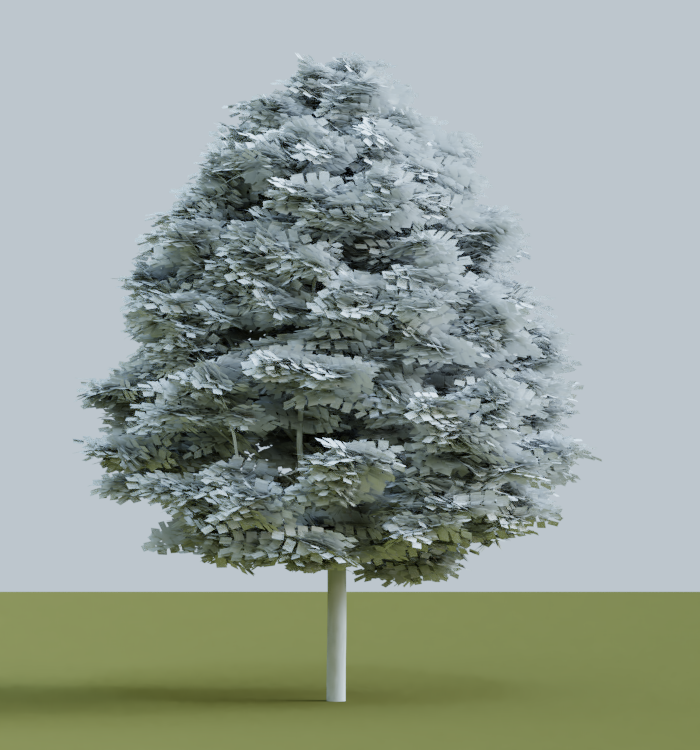 In a previous article we found that using geometry instead of alpha mapped leaves might be faster to render and in this article we investigate this further and investigate geometry and material choices that allow for realistic trees while minimizing render time and memory consumption. What do we consider to be the 'middle distance'? 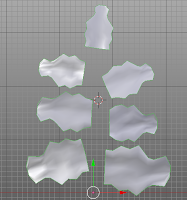 We are not dealing with image filling close-ups of hero trees but we need more details than a back-plate depicting trees at hundreds of meters away. 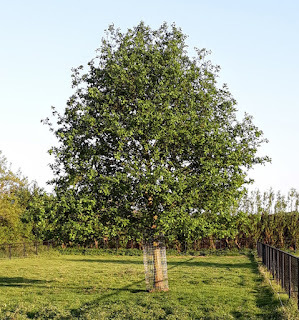 For trees I consider the middle distance a distance where we still can see that the tree consists of individual leaves and that when moving we are close enough to see a parallax effect (we see different sides of the tree and perceive it as truly three dimensional. To achieve realism at this distance then, it is necessary for the tree to be a three dimensional mesh with actual 3D branches in its crown. 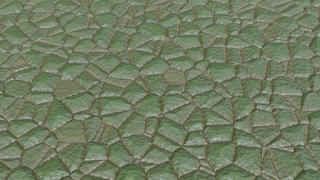 Also we will still be able to discern the outline of individual leaves (but not very clearly) but surface detail in leaves will not make perceptible difference and neither will small details in the bark texture. 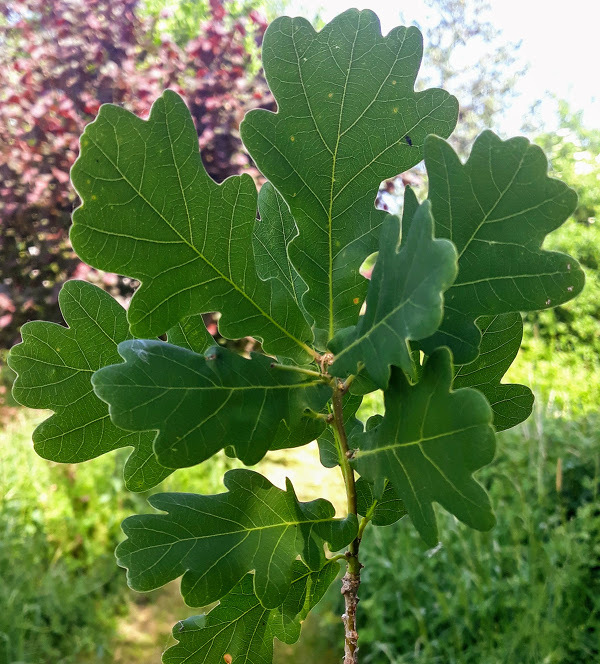 In the sections below I will illustrate the choices I made as I recreate a medium sized red oak (quercus robur) from scratch while keeping this image as a reference. To create the tree mesh I use my Space Tree Pro add-on but the observations apply to any tree mesh of course. The reference photo was shot in fairly light conditions in the afternoon in the spring (May). The tree in question is about 8 meters high and has new spring leaves that are (almost) fully grown. These leaves are individually about 10-12 cm long and all fairly even in color because there is almost no insect, mold or wind damage yet. 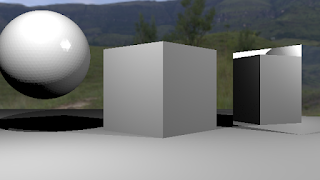 We will try to emulate the direction and intensity of the light in the original with a suitable HDRi from HDRI Haven and use filmic color management to approximate these fairly high contrast conditions. 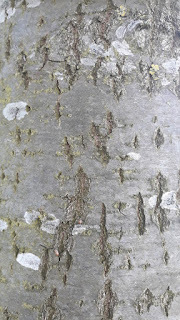 A closeup of the bark shows a fairly uniform grayish texture with comparatively few deeper structures (the tree is about 14 years old). The camera was at roughly 20-25 meters from the tree. 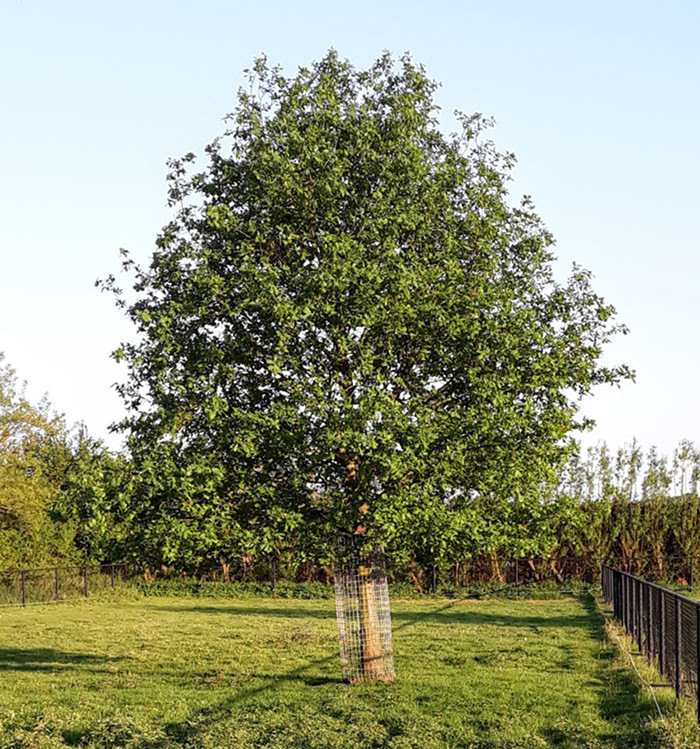 Most trees have a crown shape that is not a perfect sphere and an oak is no exception. The shape is an egg shape, wider at the bottom than at the top. The crown silhouette is not perfectly smooth still, some bumps and dents are noticeable. In more mature oak trees these irregularities will result in a more cumulus cloud-like silhouette. Even though the branches themselves are hardly visible due to the leaves, from winter photos we know they have a slightly upward bending habit and are not straight. 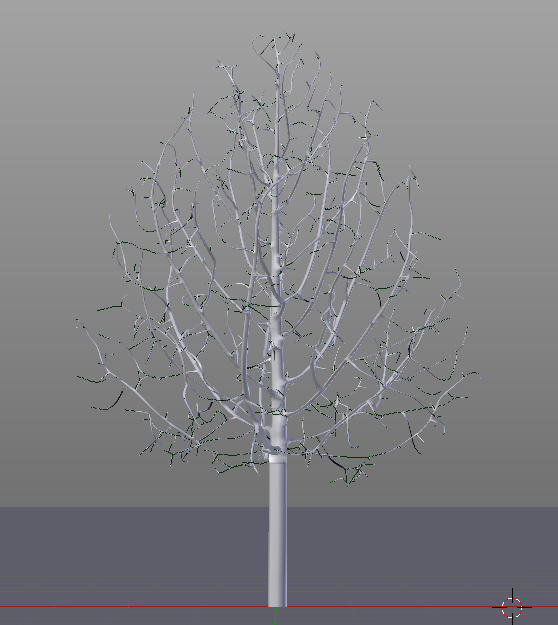 Note that we do not model every little twig; our leaf particles will be modeled to resemble twigs and not just single leaves. It is a little bit difficult to find information on the actual number of leaves on a tree of a certain age so we will do this 'by eye'. There are no leaves deep inside the crown but red oaks do not have leaves just at the end of the branches but twigs with leaves are also present deeper into the crown along the branches. Leaves are typically connected to small twigs so instead of bunching up all the leaves at points along the branches we create particles with multiple leaves like shown below. 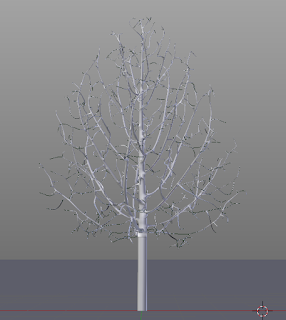 Note that at this point we don't bother with the actual shape: the leaves are rectangular and we leave out the actual twig altogether. We notice from the initial rendering that at a camera distance of 25m we can see even at this resolution that the leaves are rectangular, so we need to shape these leaves a little bit more. The leaf material is important but because we cannot see any small details at this distance it will not be necessary to use texture maps, so we will create a simple shader that uses Blender's principled shader node. Even if we are looking at fairly uniform spring foliage, for visual interest or to get a more summer-like look we might want to add some variation. 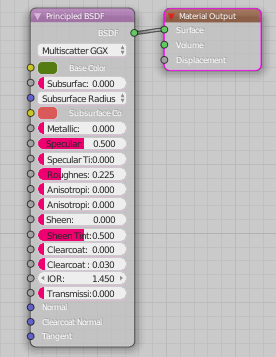 Because each particle is an object with a unique random number we can use a simple color ramp to drive this color variation. Because each particle has more than one leaf, we give each leaf a unique gray-scale vertex color as well for even more variation. Note that the front and backsides of the leaves are slightly different in real life but we ignore that. With the leaves covered we also need to look at the bark. The bark is only really visible on the main trunk. 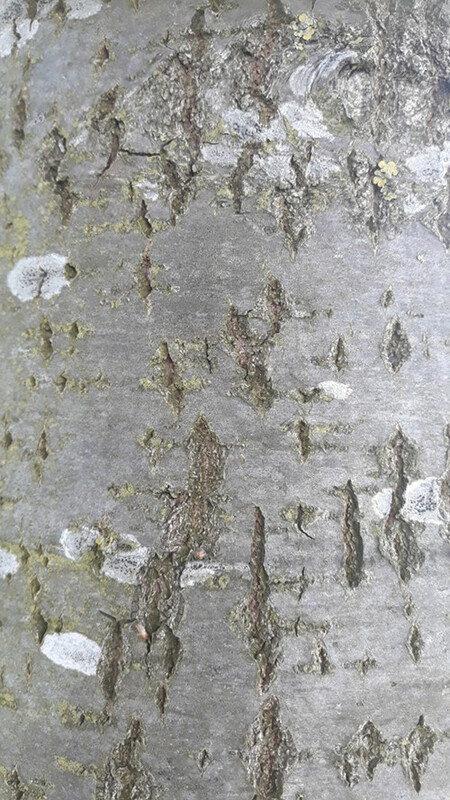 Some color variation is visible at this distance but not much and the bark structure is invisble. 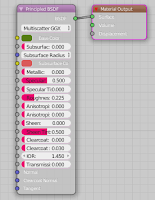 The timings were generated by simply muting the relevant nodes in the material or setting transparent to 0 in the principled shader. Cycles is smart enough to optimize away any unused nodes in the resulting shader. 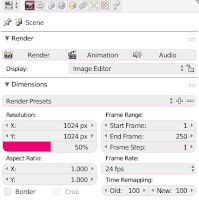 Since transparency adds quite a bit to the render time, we might skip it all together because as we have seen it is hardly visible in the end result. The 10 extra seconds for translucency however are certainly worth it. We already know that real geometry is faster than using alpha mapped textures, but what about more particles or more detailed geometry? In the images shown until now we each time had 14868 leaves on the tree, each leaf with 448 square faces. 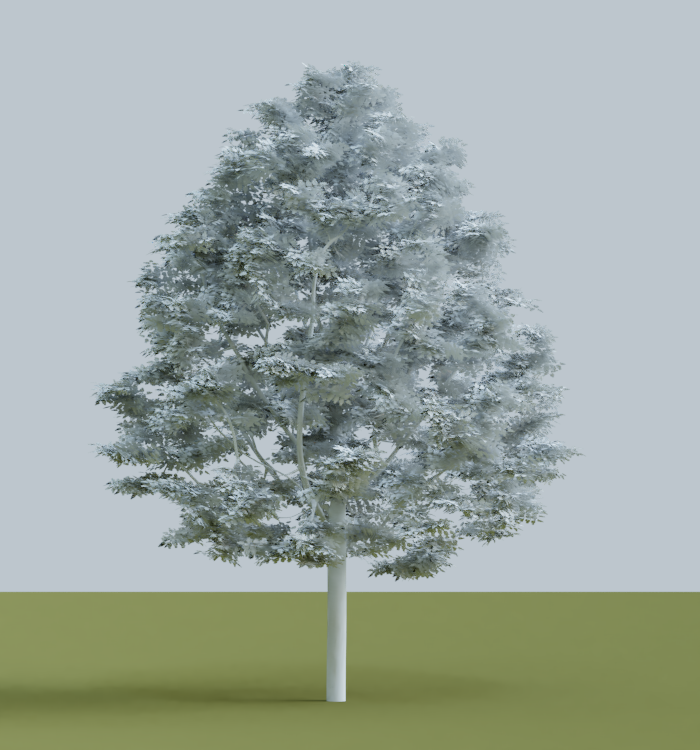 If we vary these numbers by changing the number of particles and subdividing the faces in the leaves, we can compare the render times. 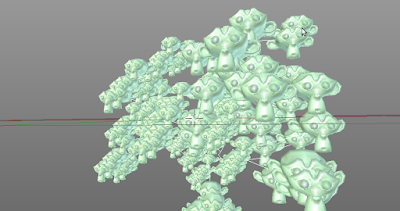 As we can see, doubling the number of particles does not double the render time. So if we need to create a denser tree crown, adding a few particles does hurt much. This is even more true for the amount of detail in the leaves: 16 times the number of faces only amounts to approximately 10% extra render time. 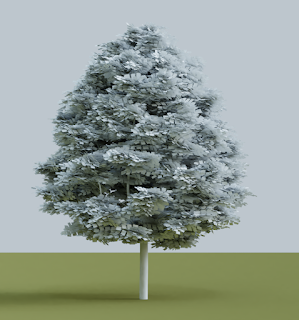 The impact on peak memory usage during rendering is minimal: at 7168 faces per particle, 10000 particles peak at 647 MB, and 20000 particles at 651 MB, so with the number of particles we need for a tree the memory usage is hardly a concern.